So much better than anything you’ve tried in your local Chinese restaurant. You’ll love the flavours and the double crunch of the veggies and wonton wrapper. Mix together ground pork, onion, garlic, celery and carrot in a bowl. Season with salt, pepper and Teriyaki Experience Teriyaki Sauce and mix until well blended. Separate the wonton wrappers and lay them out individually on a clean surface. Spoon 1 teaspoon of mixture into the centre of each wrapper. 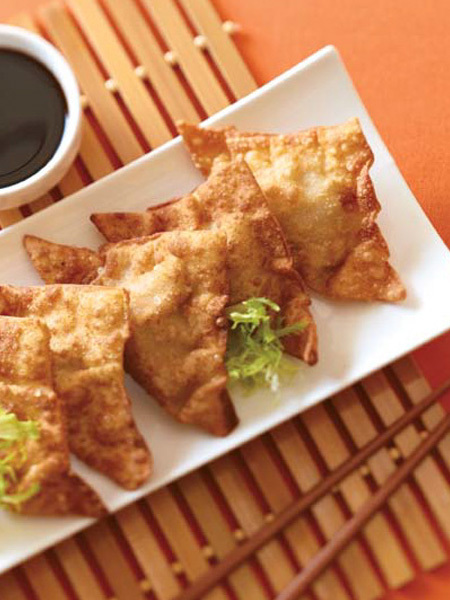 Moisten the edges of the wrapper with beaten eggs, fold wonton to make a triangle and press edges to seal. Fry wontons for 3-4 mins until golden brown. Place on a paper towel lined plate to drain. Serve with any Teriyaki Experience Sauce for dipping – Teriyaki Experience Sweet Chili Sauce is highly recommended.